(VIDEOS) TMs King Abdullah II and Queen Rania of Jordan Celebrate Independence Day. On Monday, May 25, 2015, Their Majesties King Abdullah II and Queen Rania of Jordan accompanied by His Royal Highness Crown Prince Hussein bin Abdullah and other members of the Jordanian royal family attended a ceremony in Amman to celebrate the 69th anniversary of the independence of Jordan (aka Independence Day). (VIDEO) The Crown Prince Couple of Japan View an Exhibition at The National Art Center. On Tuesday, May 26, 2015, Their Imperial Highnesses Crown Prince Naruhito and Crown Princess Masako of Japan arrived at The National Art Center in Roppongi (a district in Tokyo) to view the exhibition, Musée du Louvre: Peinture de Genre – Scènes de la vie Quotidienne. Musée du Louvre: Peinture de Genre – Scènes de la vie Quotidienne will be open to the public until June 1, 2015. 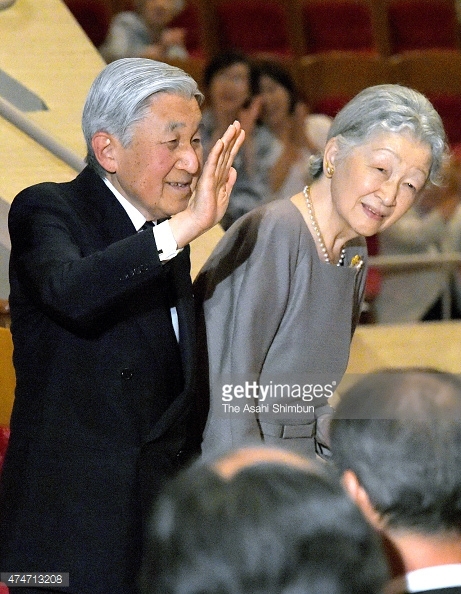 TIMs Emperor Akihito and Empress Michiko of Japan Attend an Evening Concert. Plus, Other News. On Monday, May 25, 2015, Their Imperial Majesties Emperor Akihito and Empress Michiko of Japan attended the Vienna Boys’ Choir concert held at Suntory Hall in Tokyo. Earlier in the day Their Imperial Majesties met with the Prime Minister of Malaysia, Mr. Najib Razak, and his wife, Rosmah Mansor, at the Imperial Palace. (VIDEO) TIHs Prince Akishino and Princess Kiko of Japan Attend a Memorial Service in Tokyo. On Monday, May 25, 2015, Their Imperial Highnesses Prince Akishino and Princess Kiko of Japan accompanied by the Prime Minister of Japan, Mr. Shinzō Abe, attended a memorial service for “… Japan’s unidentified war dead…” held at the Chidorigafuchi National Cemetery in Tokyo. (VIDEO) HRH Prince Harry of Wales Participates in a Charity Polo Match. On Sunday, May 24, 2015, His Royal Highness Prince Harry of Wales participated in the Maserati Jerudong Trophy match held at the Cirencester Park Polo Club in Cirencester, Gloucestershire, England.